The Automatic Power Transfer Switch Option allows the CPM Series Console Server + Switched PDU Combo to automatically switch from a primary power source to a back-up power source when primary power is interrupted. The capability to automatically transfer from one power source to another makes the CPM an ideal solution for critical applications that require a reliable power redundancy solution, and also eliminates the need to replace existing single power inlet network devices with dual inlet devices in cases where a power fallback solution is required. In applications that require power redundancy, a CPM Series Console Server + Switched PDU Combo that includes the Automatic Transfer Switch Option provides a perfect solution for out-of-band access to console ports and power reboot switching functions. 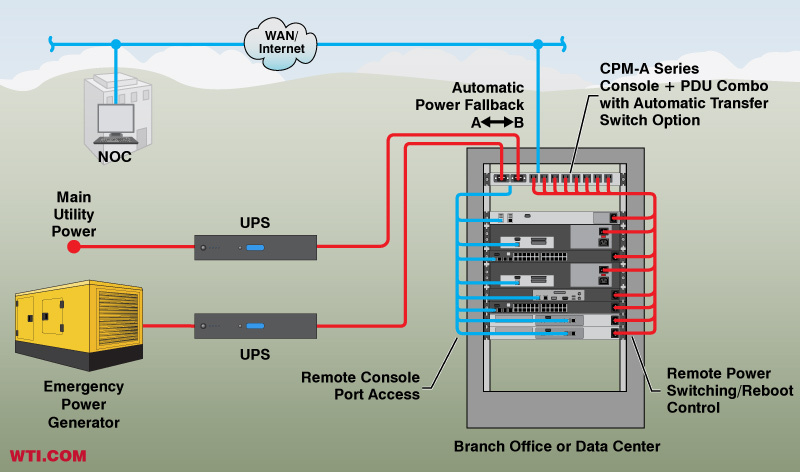 When an outage disrupts the power supply to the CPM, the Automatic Transfer Switch Option allows the CPM to immediately switch over to a back-up power supply, ensuring that attached devices have uninterrupted access to power and that the CPM's console access and power switching functions are available when needed. In addition to helping to minimize downtime by helping to ensuring that power is always available to the CPM and attached devices, the Automatic Transfer Switch Option also provides power redundancy for single power inlet network devices, eliminating the need to replace existing single inlet devices with dual inlet devices when implementing a power redundancy strategy. As shown in the table above, CPM Series Console Server + Switched PDU Combos are also available with a Dual Ethernet Option, Current Metering Option, Internal Modem Option and 4G LTE Cellular Option, allowing you to custom tailor the CPM to fit the requirements of almost any remote, out-of-band network management application imaginable.